In all of my jewellery and other objects in the gallery, the glass beads have been designed and melted by me. 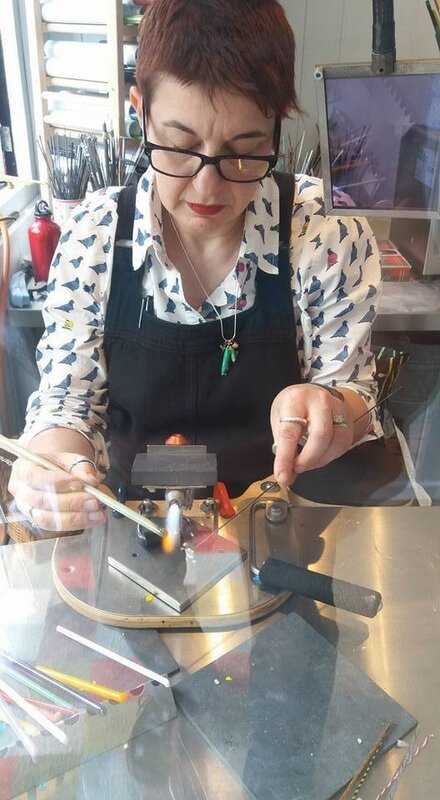 The process starts with me ‘catching’ a large pea-sized drop of glass from a solid coloured rod around a thin metal rod (mandrel). This is how you form the hole, as part of the bead when it’s hot. The mandrel has been dipped in a bead release liquid – similar to kiln wash used by potters – and the initial round shape can be gently manipulated and patterned using more glass and small tools – some dentist tools are particularly good. Each bead takes between 5 minutes and ½ an hour to make. Some complex beads can take an hour or more. Once the design is complete, they are immediately put to cool in a special bead kiln where they remain for 5 or more hours, cooling very slowly. Finally they are removed from the mandrel, cleaned and gently filed to ensure a smooth hole. Then it’s time to start the jewellery or miniature picture design process! ​I began bead making in 1996 and have become well known for making very small bead designs which include fungi, rockets, birds, cacti, acorns and more. I am a Founder Member of Glass Bead Makers UK and am part of the small team who co-ordinate Warwickshire Open Studios. My tiny designs delight and confound people in equal measure!